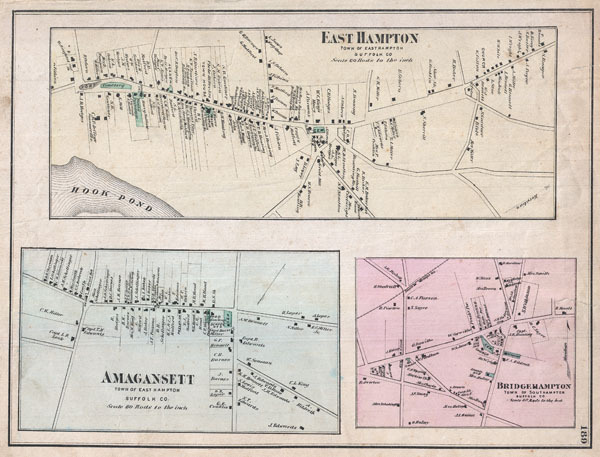 East Hampton, Town of East Hampton, Suffolk Co. Amagansett, Town of East Hampton, Suffolk Co. Bridgehampton, Town of Southampton, Suffolk Co.
A rare example of Fredrick W. Beers' Map of the towns of East Hampton, Amagansett, and Bridgehampton. Published in 1873, this is actually three maps on one sheet. The top map details East Hampton, the bottom right map focuses on Amagansett, and the lower right map details Bridgehampton. Beers maps are highly desirable for their superb detail down to the level of individual buildings and household family names. Prepared by Beers, Comstock & Cline out of their office at 36 Vesey Street, New York City, for inclusion in the first published atlas of Long Island, the 1873 issue of Atlas of Long Island, New York. Beers, F.W., Atlas of Long Island, New York. From Recent Actual Surveys and Records Under the Superintendence of F. W. Beers. (1873 First Edition). Good condition. Minor verso repairs largley limted to marginal areas. Part of Sag Harbor map on verso. New York Public Library, Map Division, 1527357.